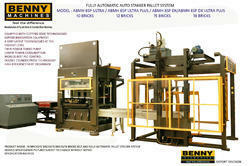 Offering you a complete choice of products which include fully automatic flyash brick machine pallet stacker system, fully automatic fly ash brick machine pallet stacker system and hydraulic fly ash brick making machine. 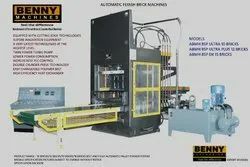 Worlds no 1 fully Automatic flyash brick machine pallet system with stacker for production of first class bricks Avilable in 10/12/15/18 bricks all Double Cyclinder heavy pressing models fully PLC Operated. We are offering Fully Automatic Fly Ash Brick Machine Pallet Stacker System to our client and we assure satisfaction and quality of the product. Reckoned as one of the emerging companies of the industry, we are extremely immersed in providing Hydraulic Fly Ash Brick Making Machine. Looking for “AUTOMATIC FLYASH BRICK MACHINE”?